A group of bearings can be considered in the calculation. The bearings are assumed to be connected to a rigid shaft and housing. The loads or displacements are given for the origin of the bearing group instead for each single bearing. A relative position can be entered for each bearing. An axial offset allows the definition of pretension in the system. The offset is an additional movement of the outer ring of a bearing. The displacements, forces and moments under loading are applied at the reference position 0. So in most cases, the positions should be chosen symmetrically around zero. For bearings with a contact angle, the position of the cone center can be specified. In the picture, an O-configuration (or back-to-back configuration) is defined. Additional bearings can be added using the -button. A row can be deleted using the - and the -button clears all inputs. The possibility of bearings groups allows the calculation of 8-point ball bearings as two rows of four-point bearings; it allows sets of angular contact bearings, paired taper rollers or sets of cylindrical roller bearings which could be used in a planetary gear. With the context menu (right mouse button) in the table, several results values can be shown in the table. 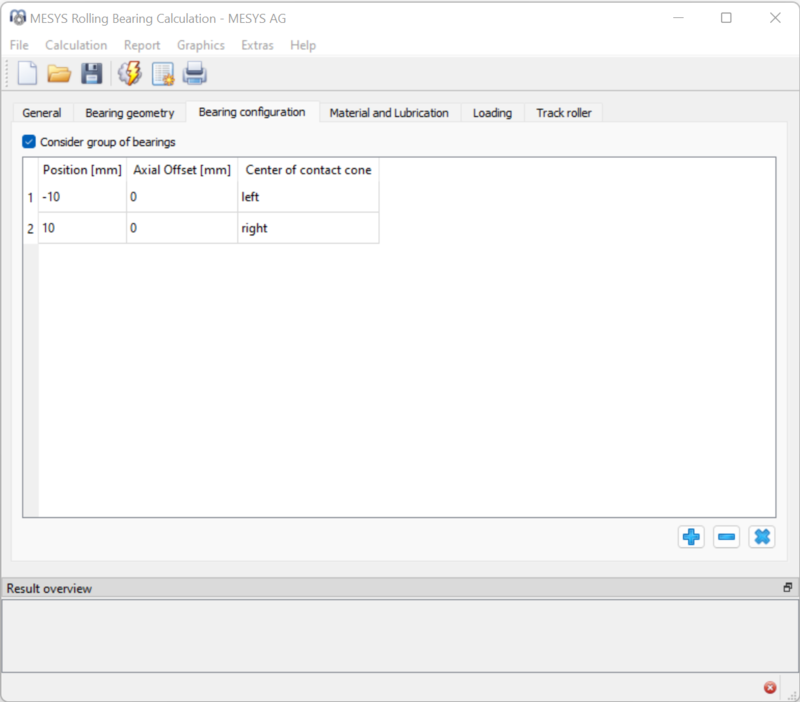 This allows seeing quickly how load or life is distributed among the bearing rows.